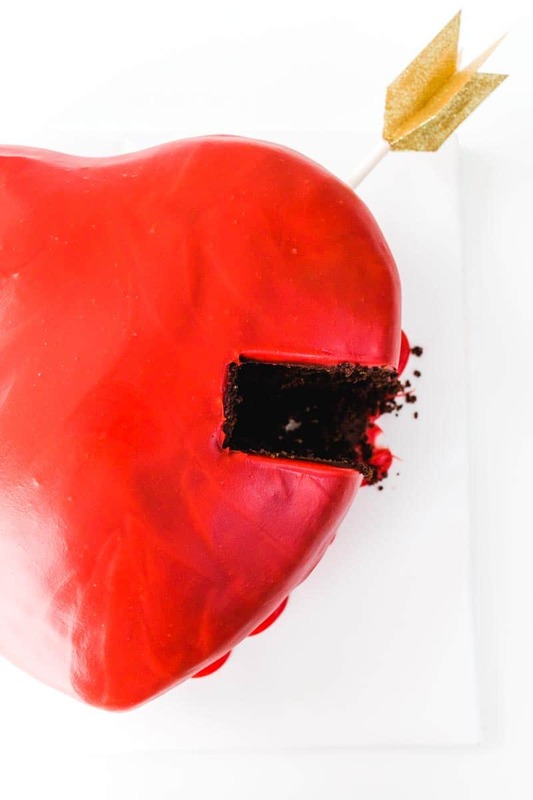 Today we’re celebrating your love for your sweetheart with this chocolate puffed heart valentine’s day drip cake. Yeah that’s a mouthful, but there is so much goin’ on in this cake. 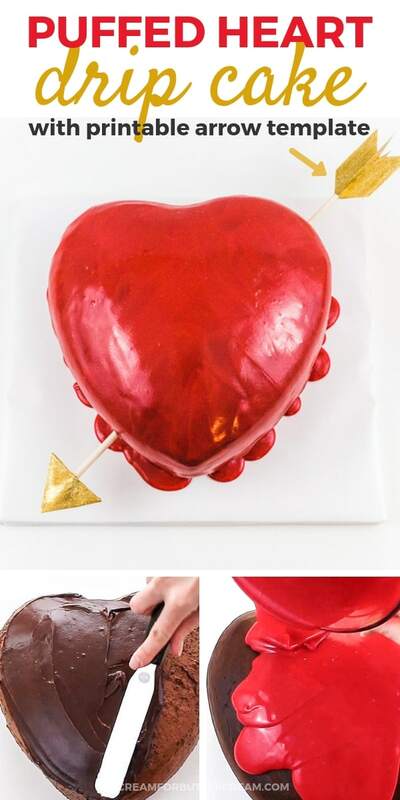 It’s such a cute and fun cake decorating idea for Valentine’s Day. 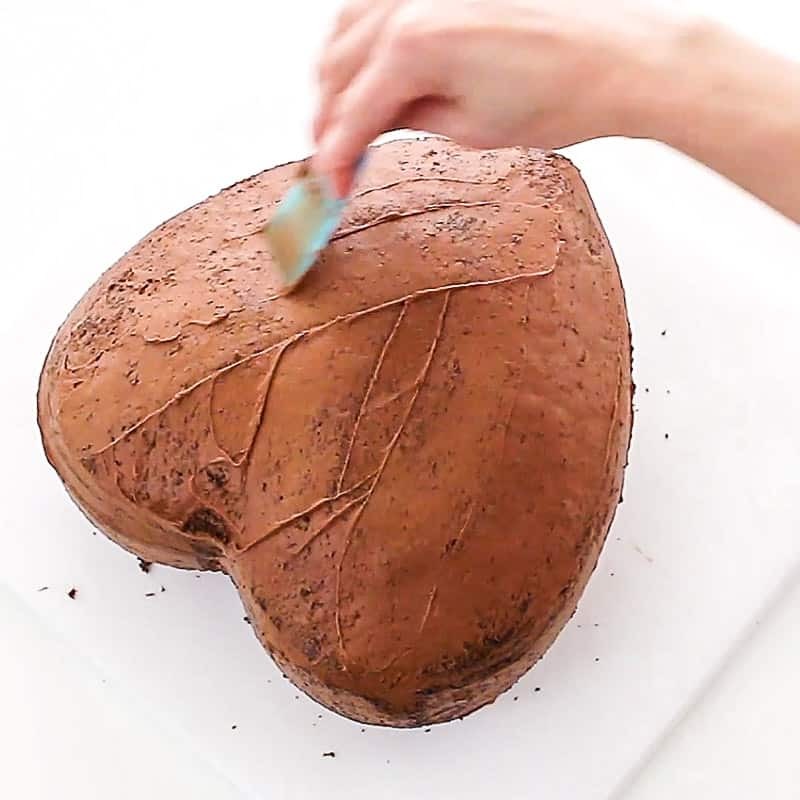 I think you’ll really love how easy this cake tutorial is…it just takes some time. It’s not complicated, just time consuming. It really is a labor of love, but I think the results are worth it. 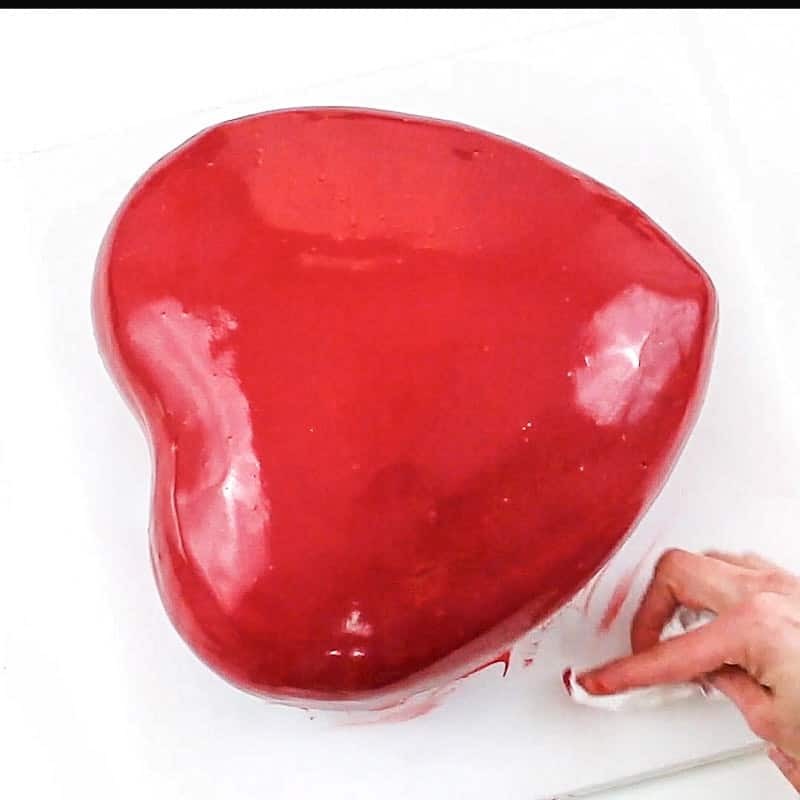 Really the hardest part about this cake, is carving it into a puffed shape. 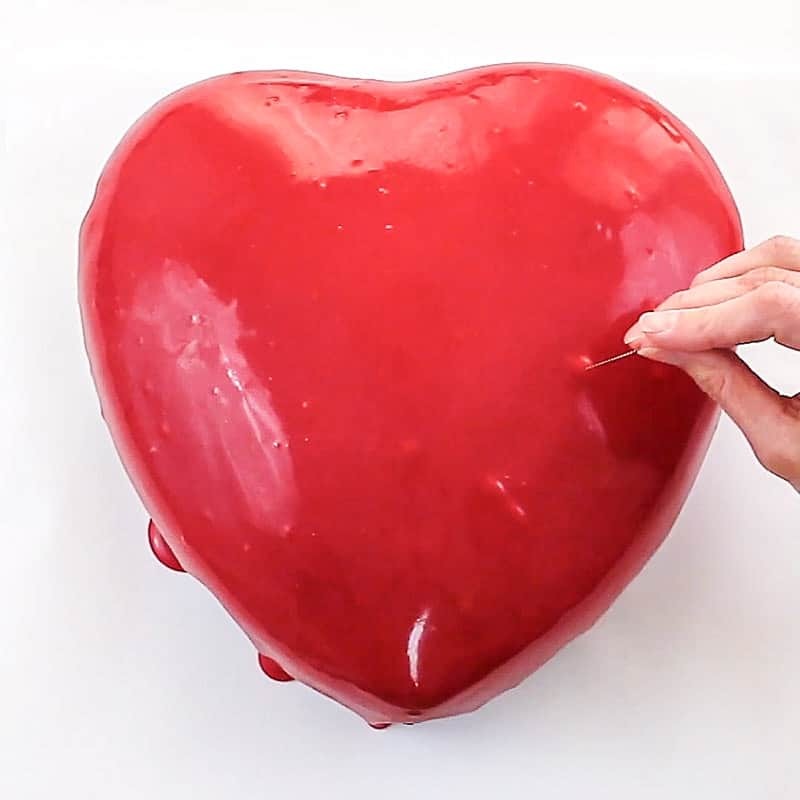 The trick is to just cut off any hard lines you see and before you know it, it’ll look like a puffed heart. Wilton used to have the puffed heart pans, but apparently they discontinued those. 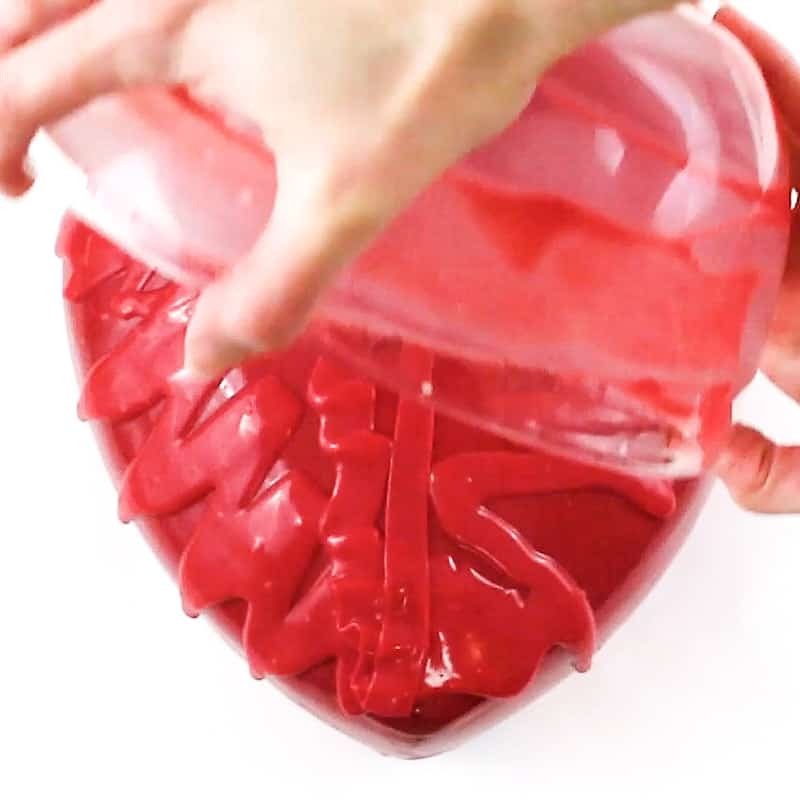 No fear though, you can do this yourself with just regular heart pans. 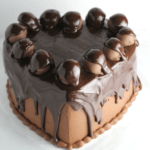 Now, there are two types of ganache (or ganaches…what exactly is the plural version of ganache?) for this cake. We’ve got a semi-sweet chocolate ganache and a white chocolate ganache, which is the one you’ll be turning red to pour over your cake. 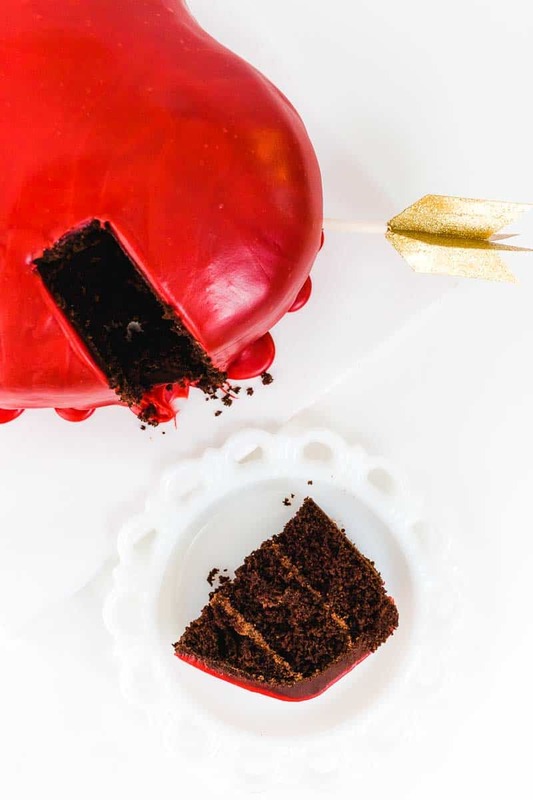 Decide whether you’ll be covering your whole cake in the red ganache, or just doing a light drip effect on the top of it. I just went for it and covered my whole cake, then did another light drippy coat on top of that. 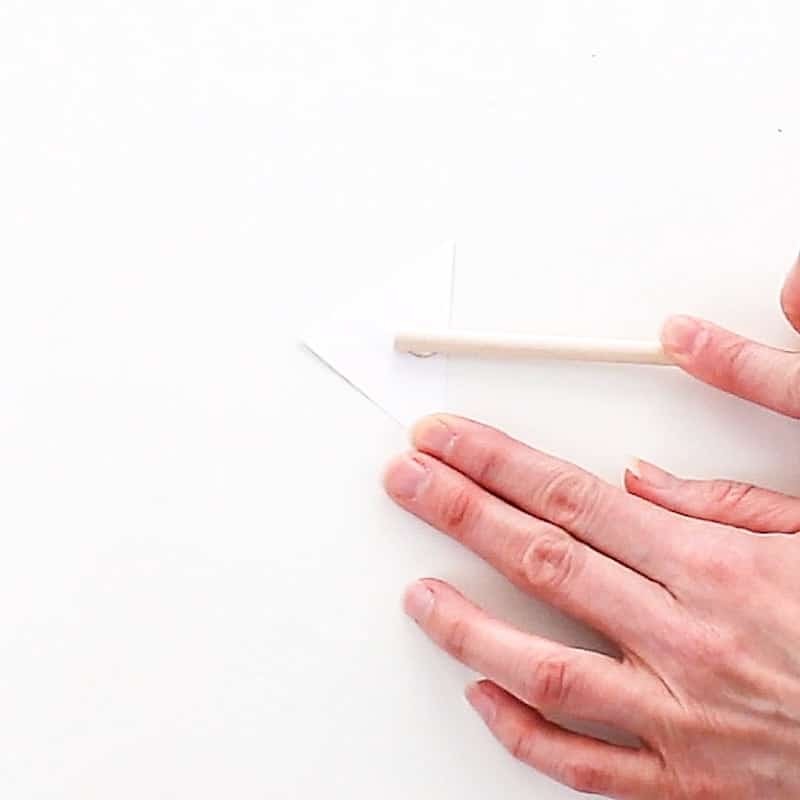 You’ll also want to prepare your arrow ahead of time. I’ve even got a printable template to help you with that, which you’ll find in the supply list below. I’ve included screenshots of the whole process, but there’s also a video toward the end of this post, that will show how everything comes together. 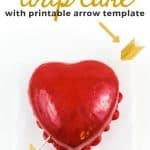 3 baked heart shaped cake layers – I used these 10″ heart pans and it took almost an entire cake recipe to fill one pan. 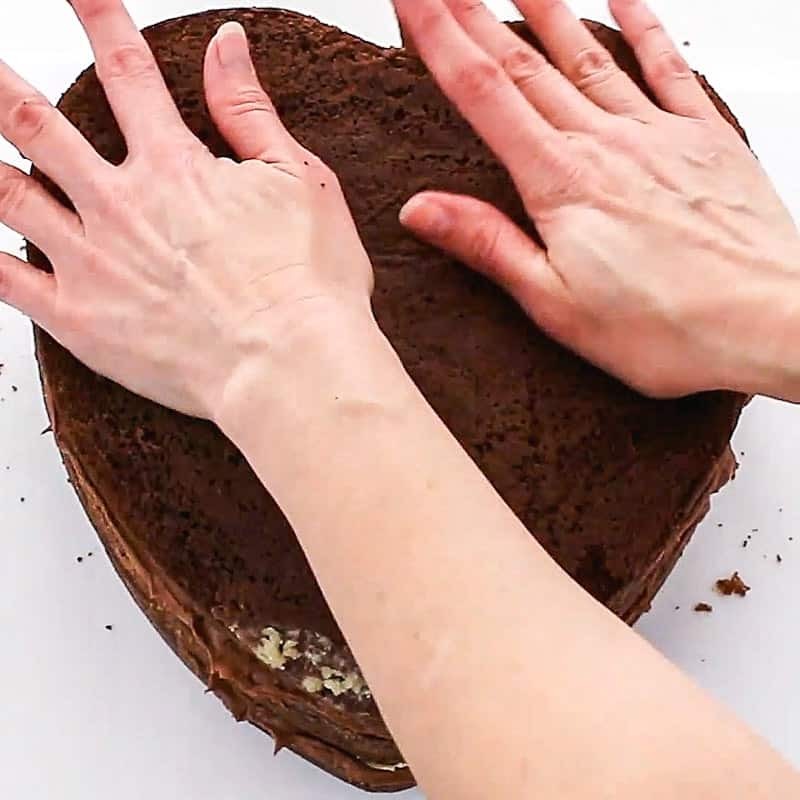 You can use the smaller heart pans if you want a smaller cake. 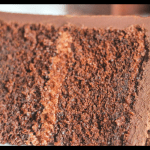 (Chill these cake layers. I don’t say that much, but you’ll be carving these cakes, so it helps if they’re chilled.) 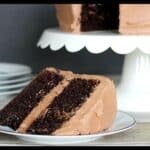 You can also use either chocolate cake mixes, or if you want a scratch cake, see my Chocolate Butter Cake Recipe. 1 recipe white chocolate ganache – 12 oz white chocolate chips to 10 oz heavy cream. See above note about making ganache. 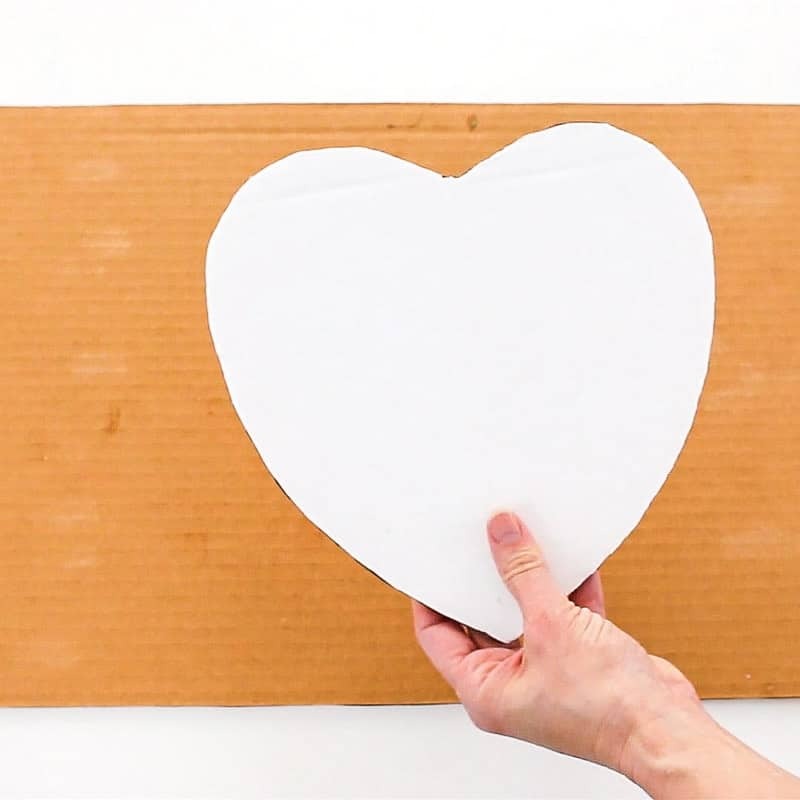 Large round and square or rectangle cardboard cake boards – You’ll need these to make the heart cake board and cake base. 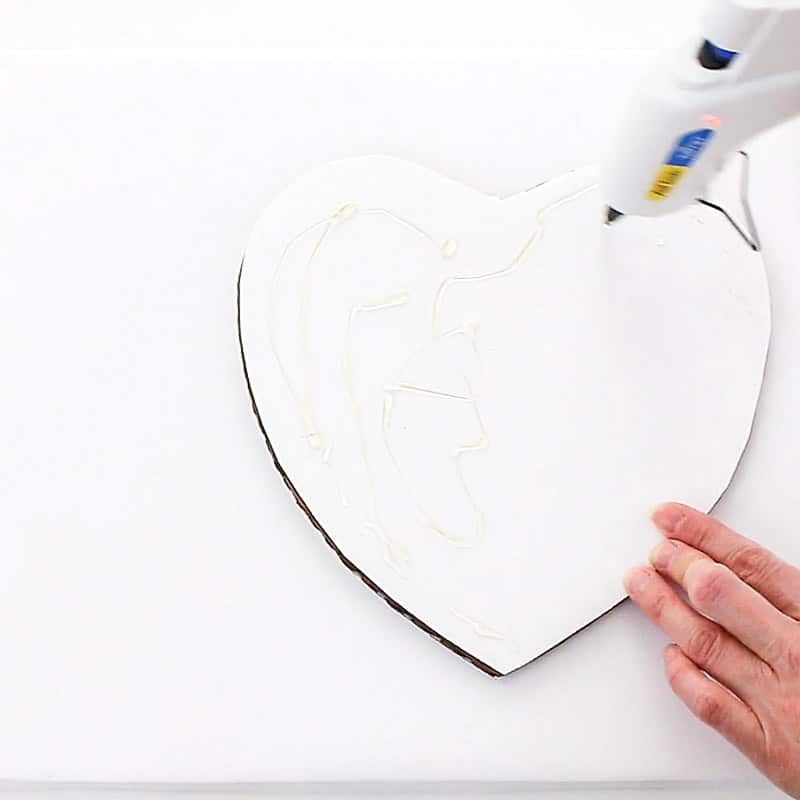 Hot Glue Gun & Hot Glue – You’ll use this to attach your cake board to the cake base. 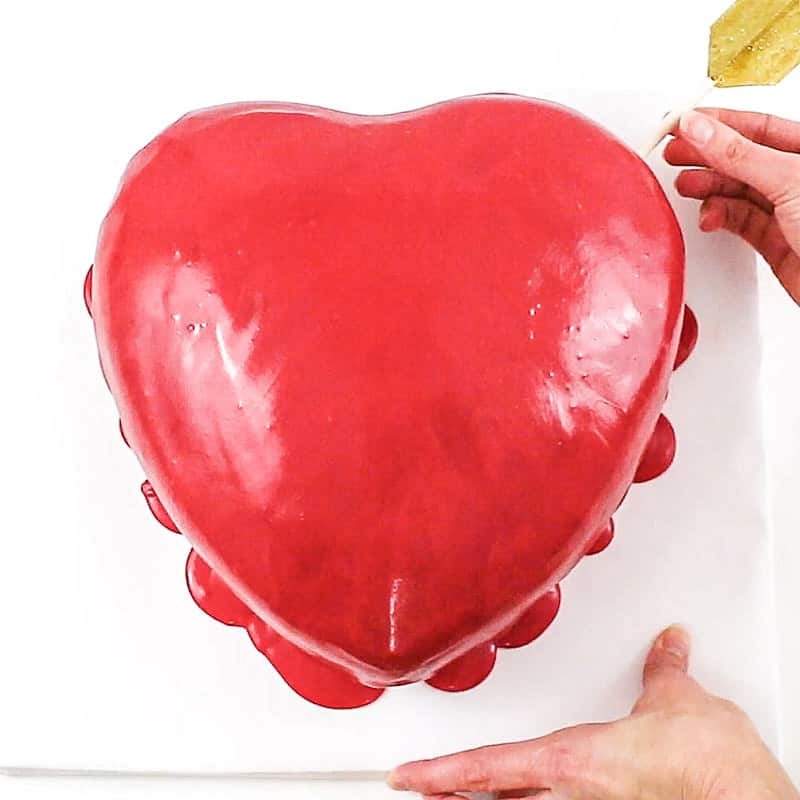 First you need to make a heart cake board for the cake to sit on. 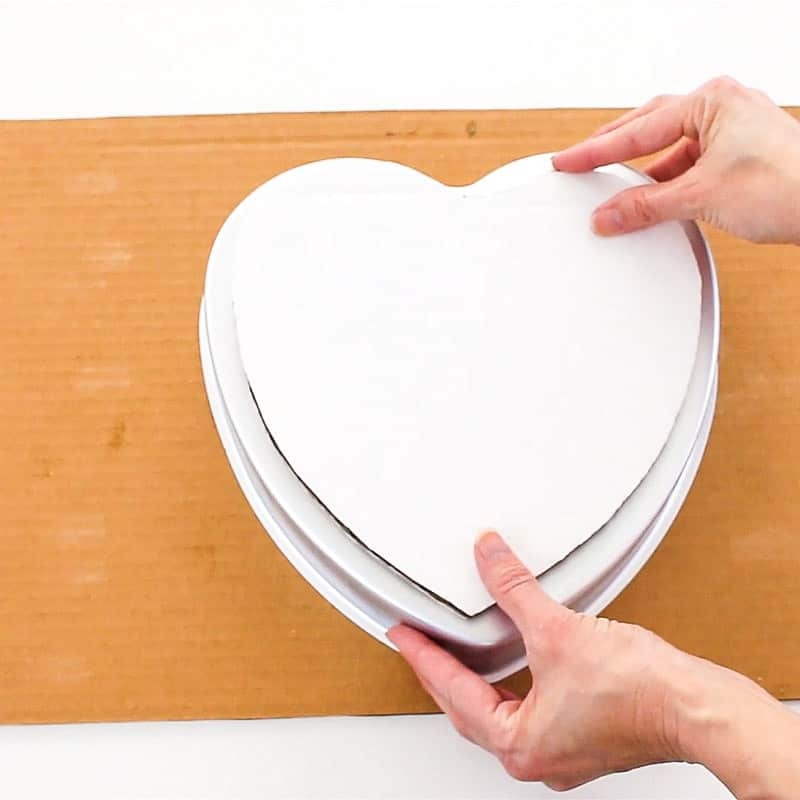 Just use your heart cake pans and trace around them onto some cardboard. 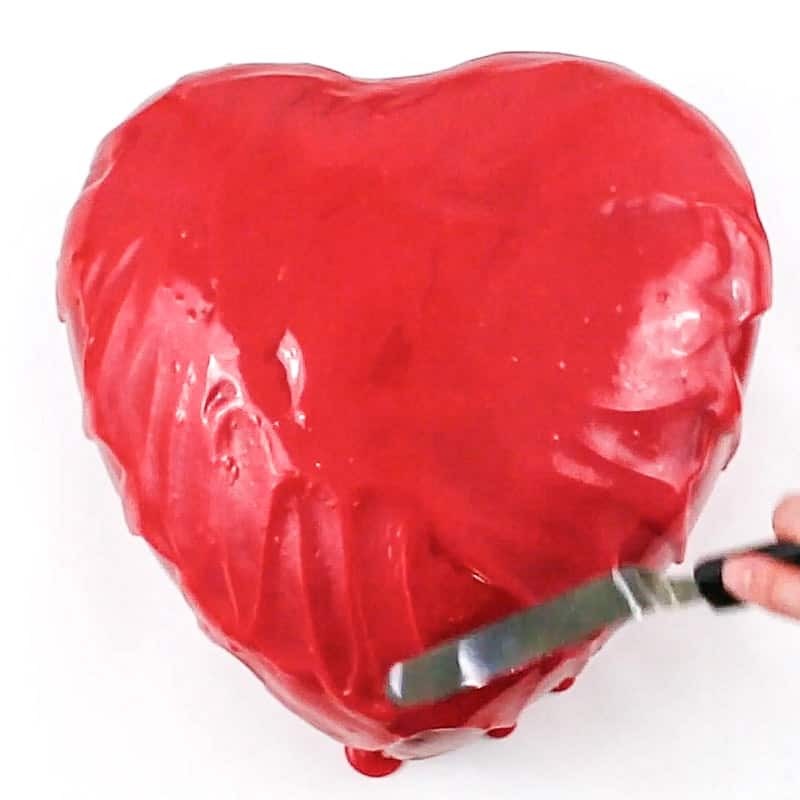 Now just glue the two hearts together. You need it sturdy…that’s why you’re using two. 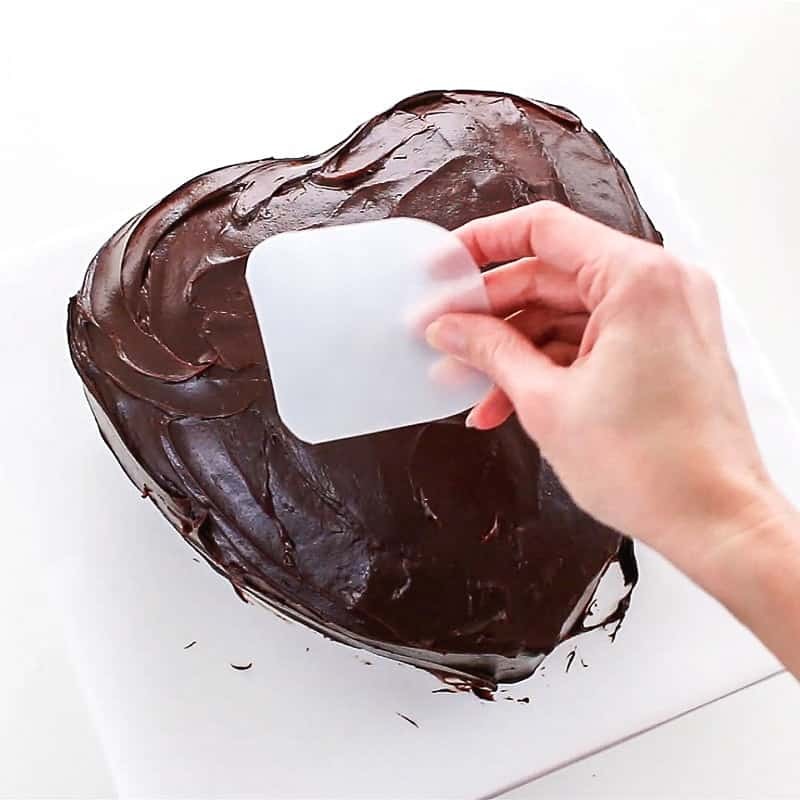 You also want to cut your heart cake board a bit smaller than the cake pan. That’s because you’ll be carving in the bottom of the cake a bit and you don’t want the cake board to show. 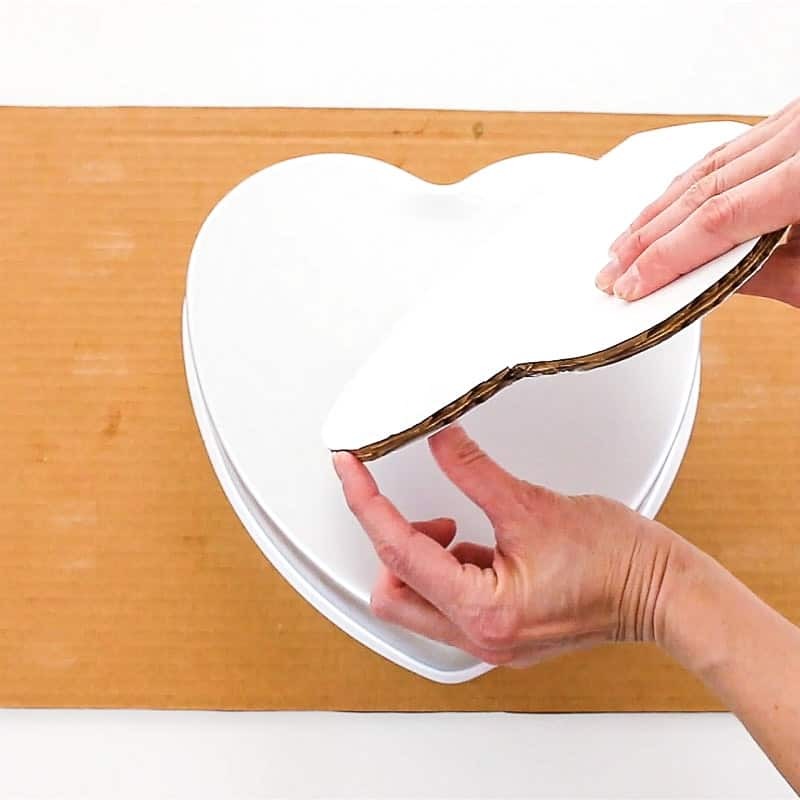 Ok, once that’s done, you’ll need to make a cake base for this heart cake board and your cake to sit on. 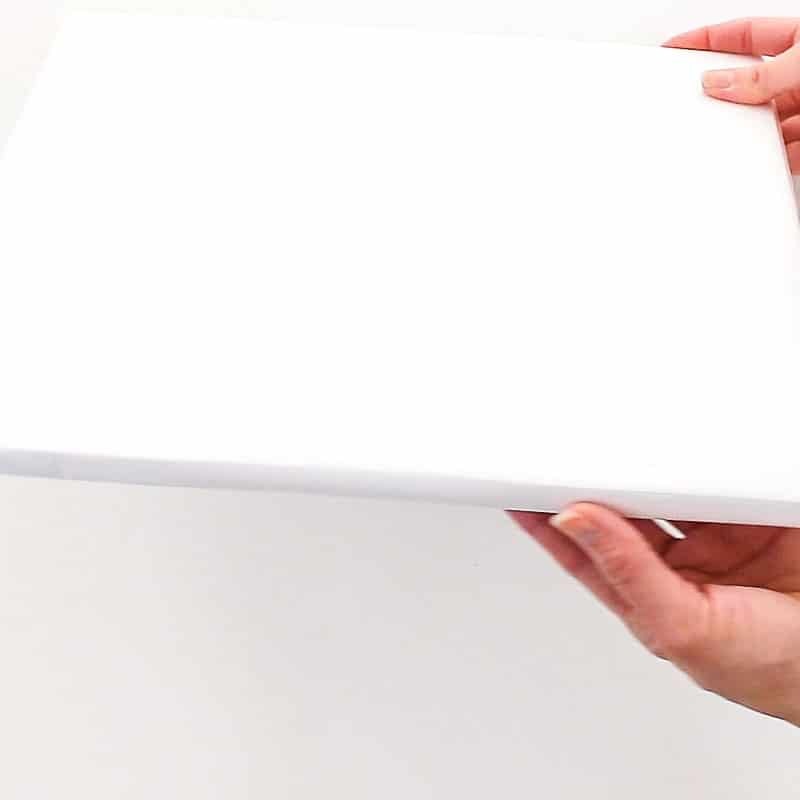 You can either use a thick foam core board, or glue several pieces of cardboard together. You need it to be firm though and big enough for the cake to sit on and have room around it. Mine ended up being about 14″ x 13″. You’ll then want to cover that with white fanci foil or just some white paper. 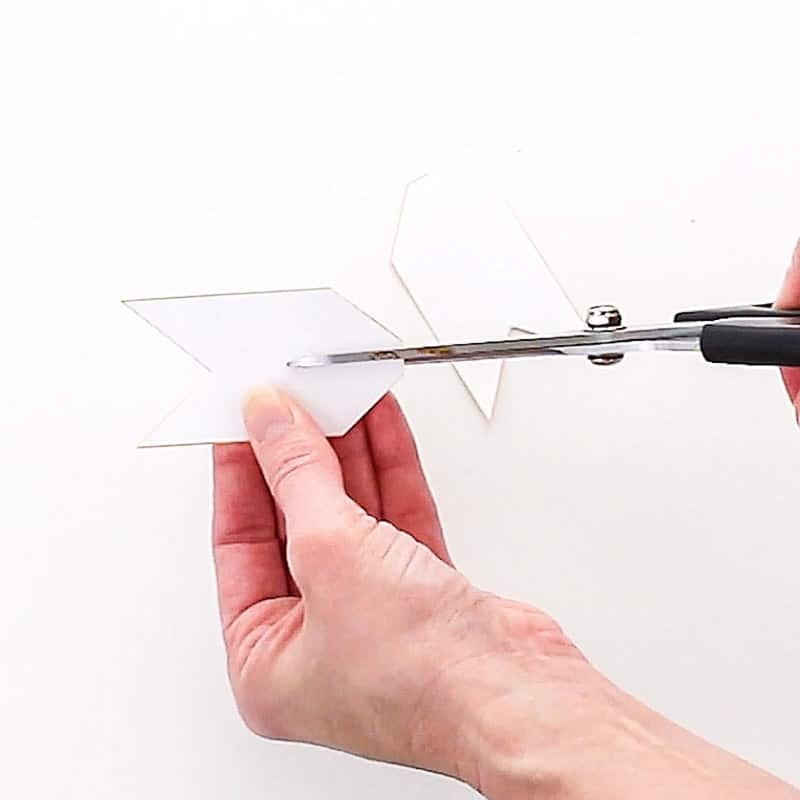 If you cover it with white paper, you’ll then want to cover it with clear contact paper to form a barrier. That’s what I did here. 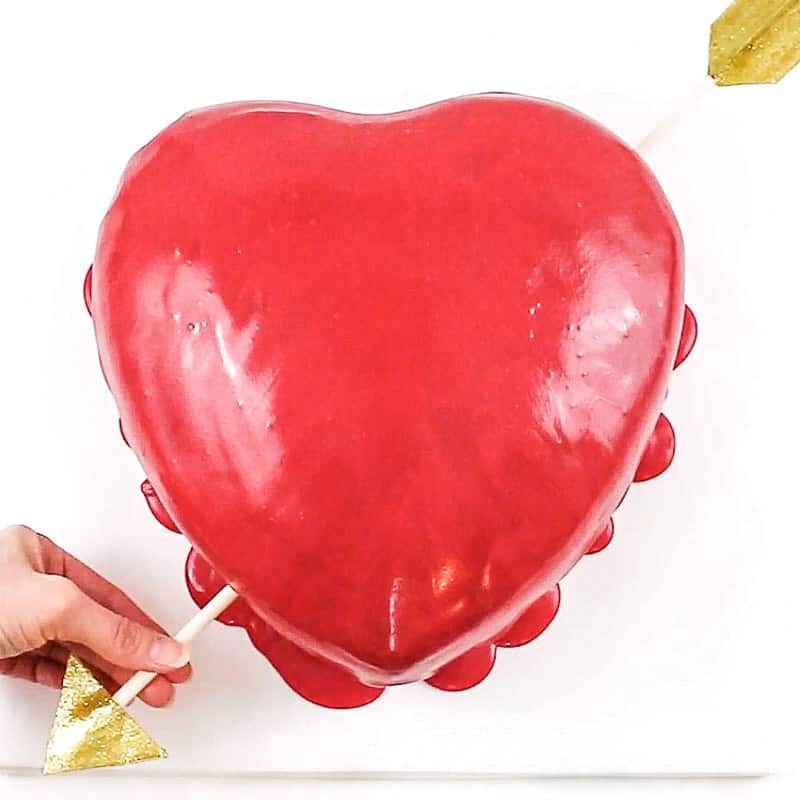 Alright, now you need to hot glue the heart cake boards onto the cake base you just made. 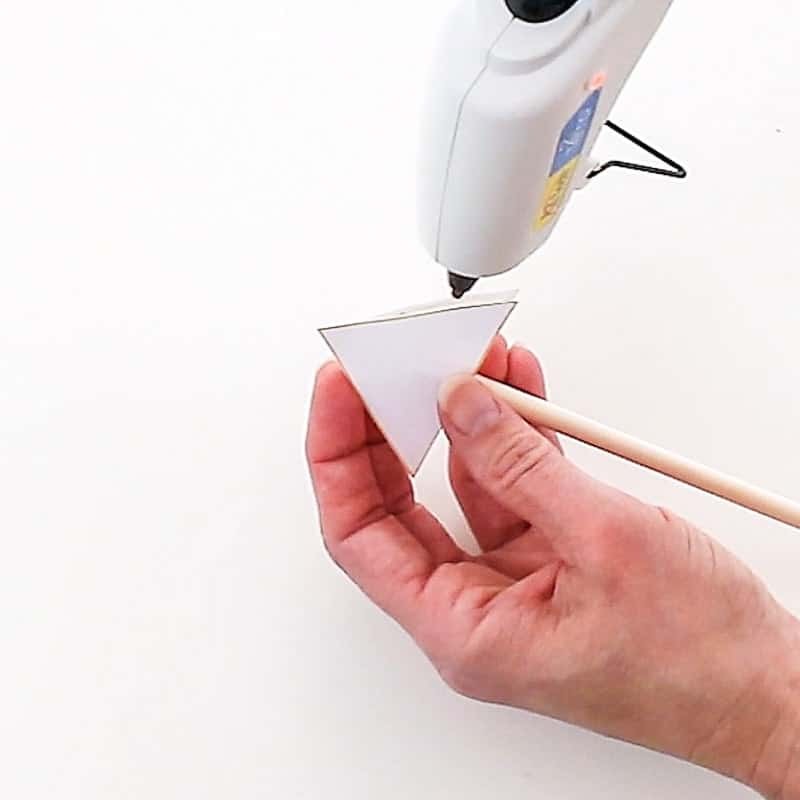 No food will be touching the hot glue, so don’t worry about that. Just push it down and make sure it’s good and stuck there. 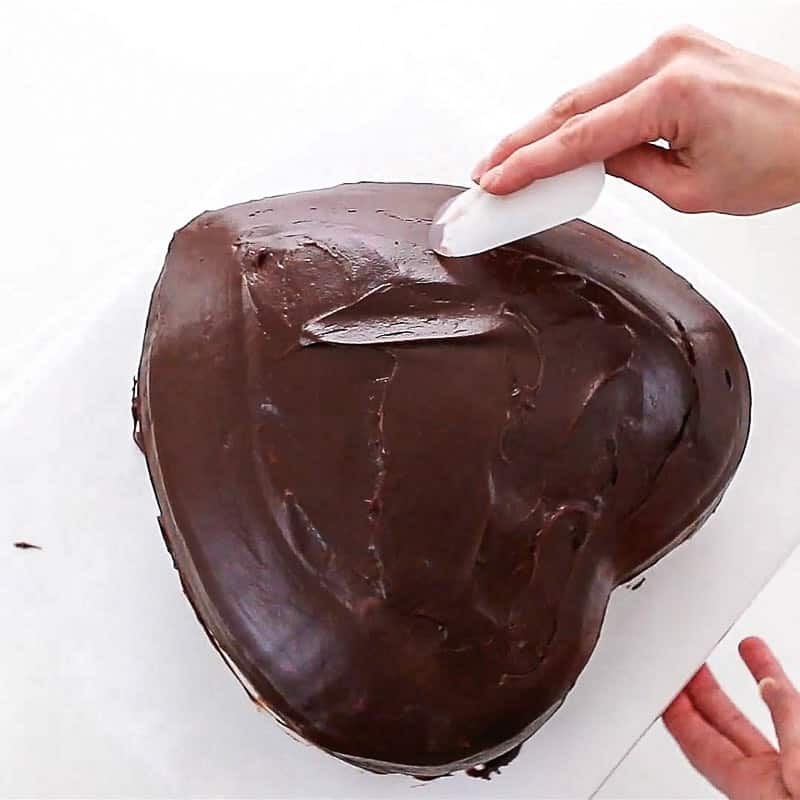 Ok, now that that’s done, you’ll want to work on your arrows, so they’ll be dry and ready to insert into the cake when you’re ready for them. 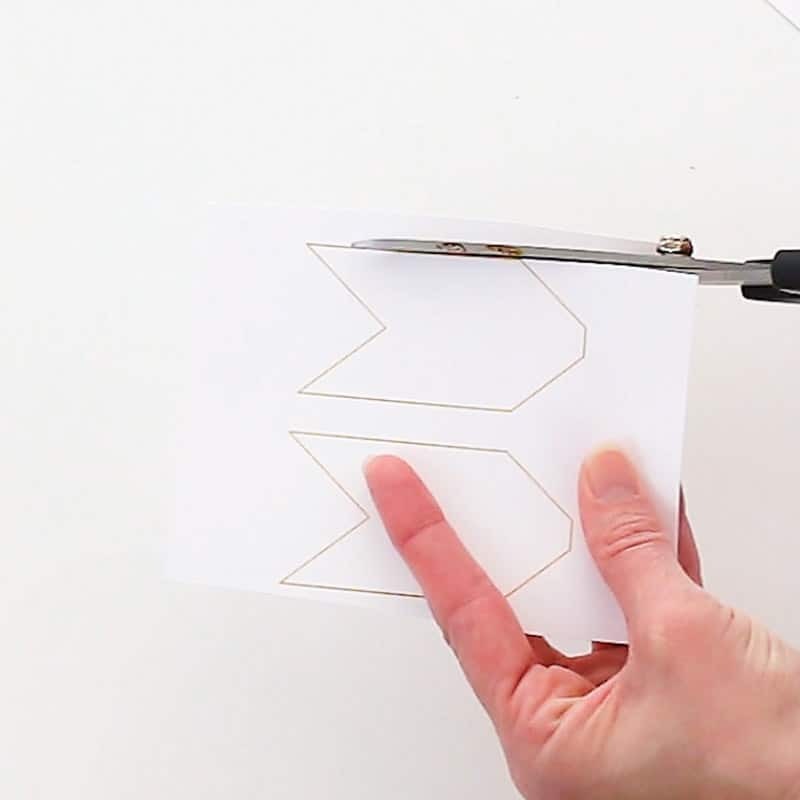 Now, remember to go up to the supply section and print out the arrow template on cardstock paper. Now just slide the feathers together using the slits you just cut. Make sure the tops are even. If they’re not, just cut and adjust more. 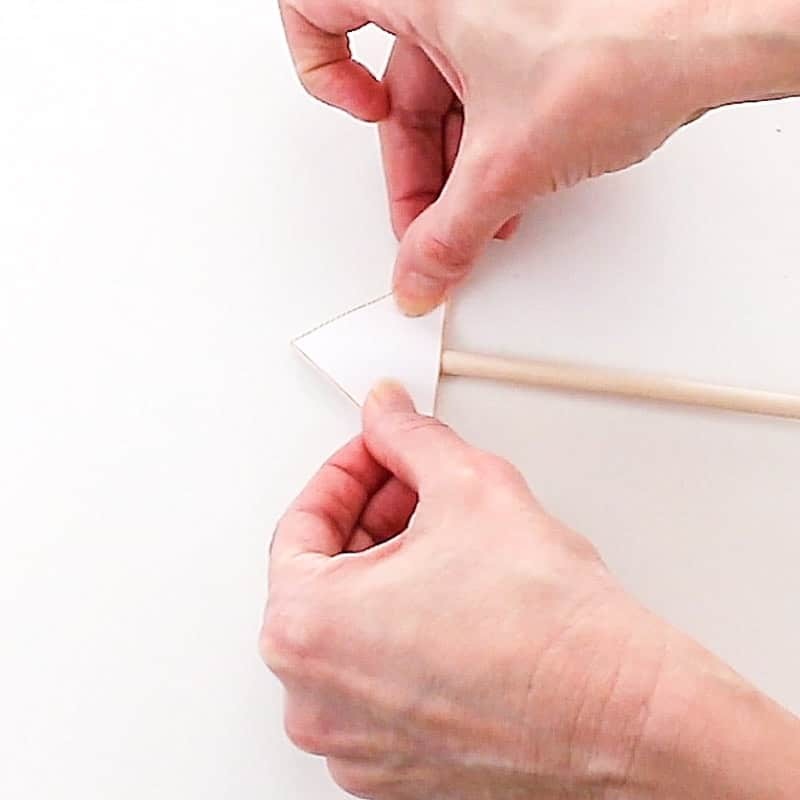 Ok, now take the paper arrow and hot glue it onto the flat end of one of your wooden dowels. Just one arrow piece on one side of the dowel and the other on the other side of the dowel. 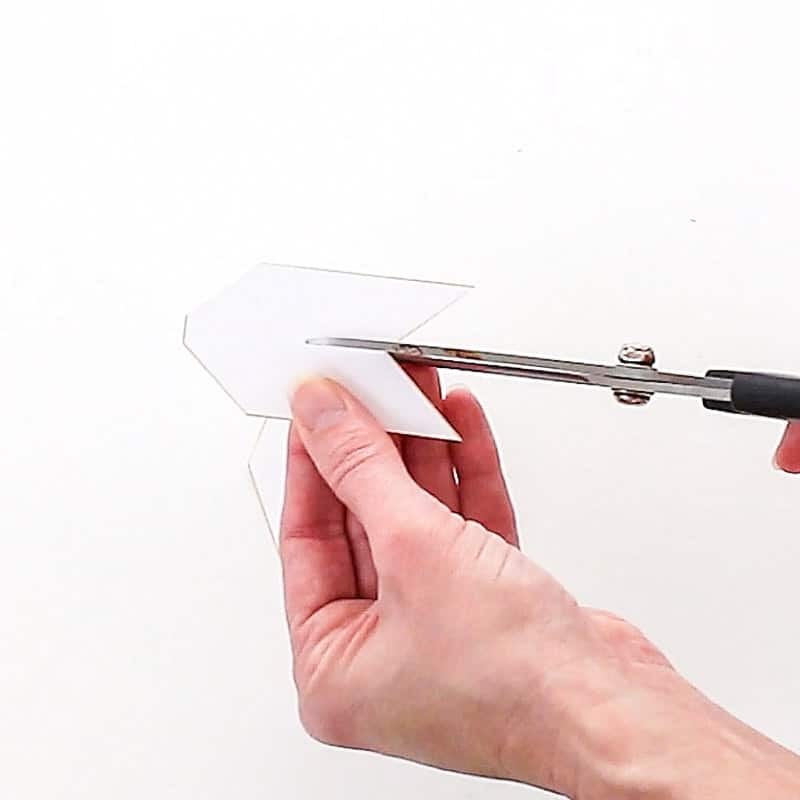 Then glue around the edges. 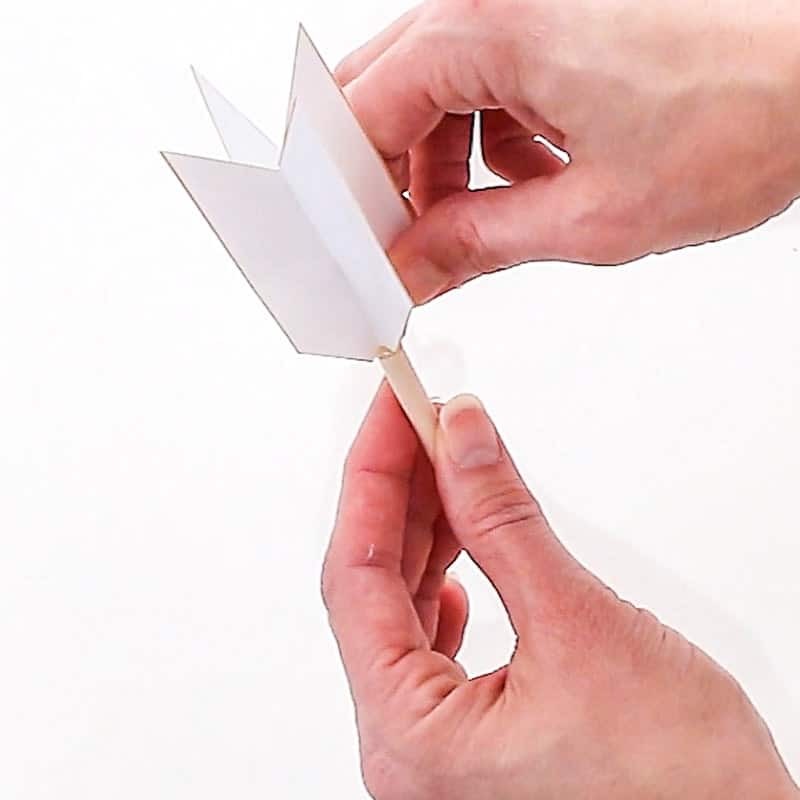 Next glue the paper feathers onto the end of the other dowel. You’re gonna have to hold them there for a bit until they’re good and stuck. 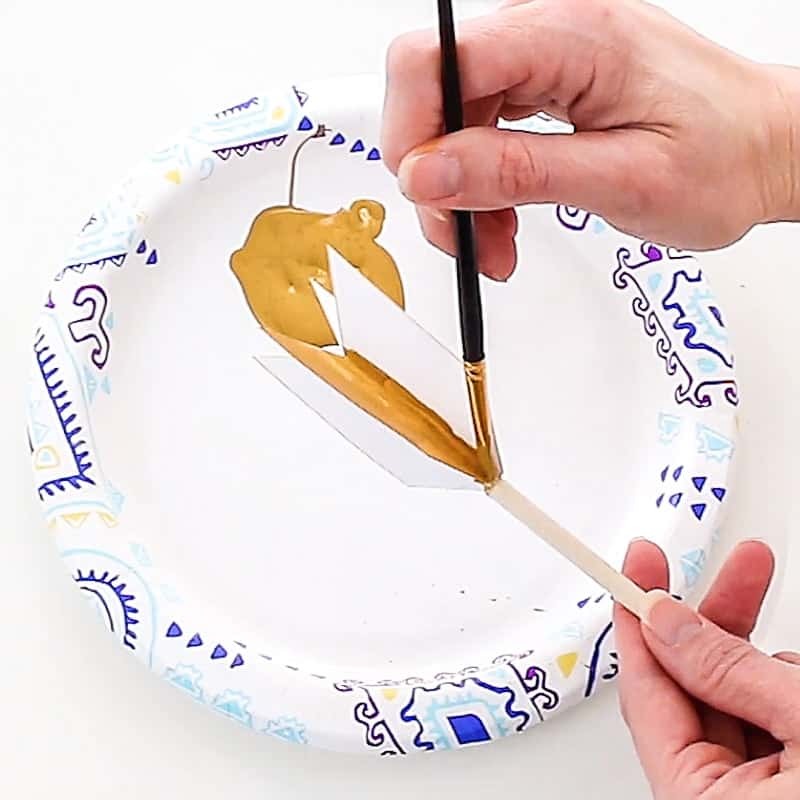 Now just paint the paper arrow and feather with your gold craft paint. 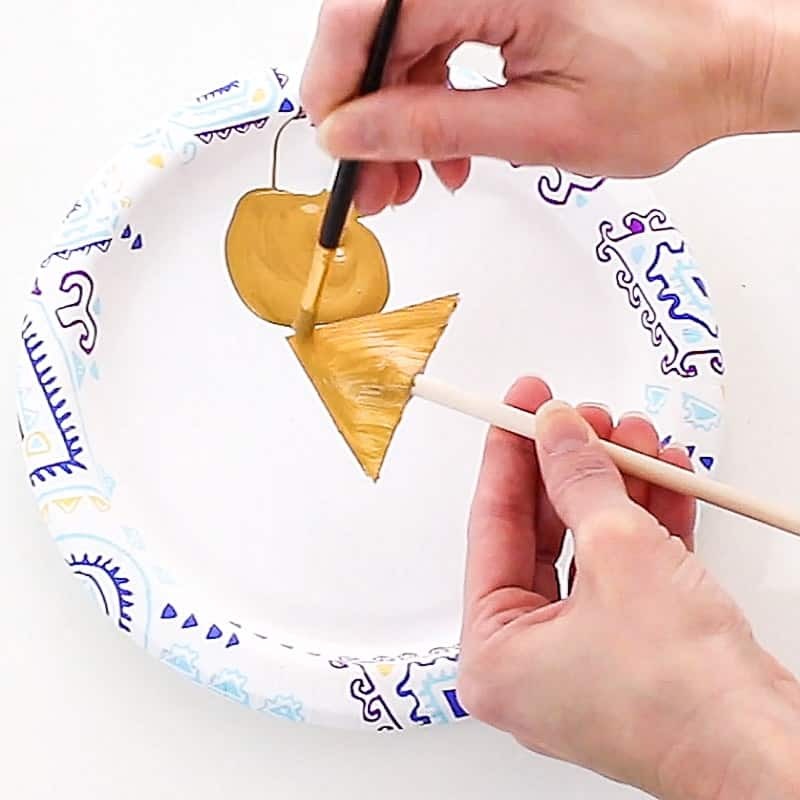 Paint all sides. I did two coats here. 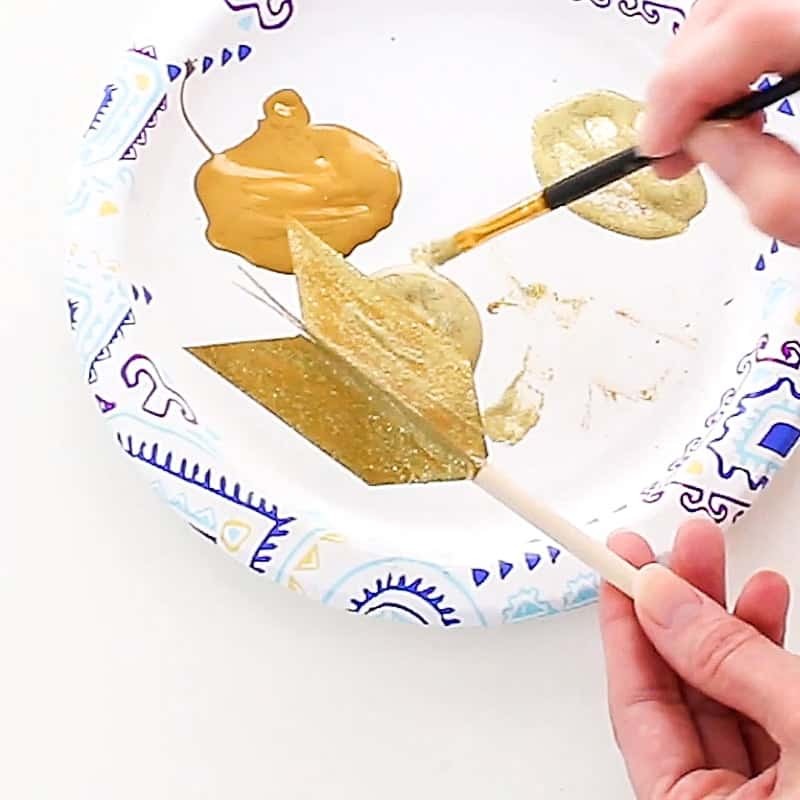 Once the gold paint is dry, you can paint on some glitter. I did two coats of this as well. You can set these into some foam to dry until you’re ready to use them. Now you’ll bake your cakes. 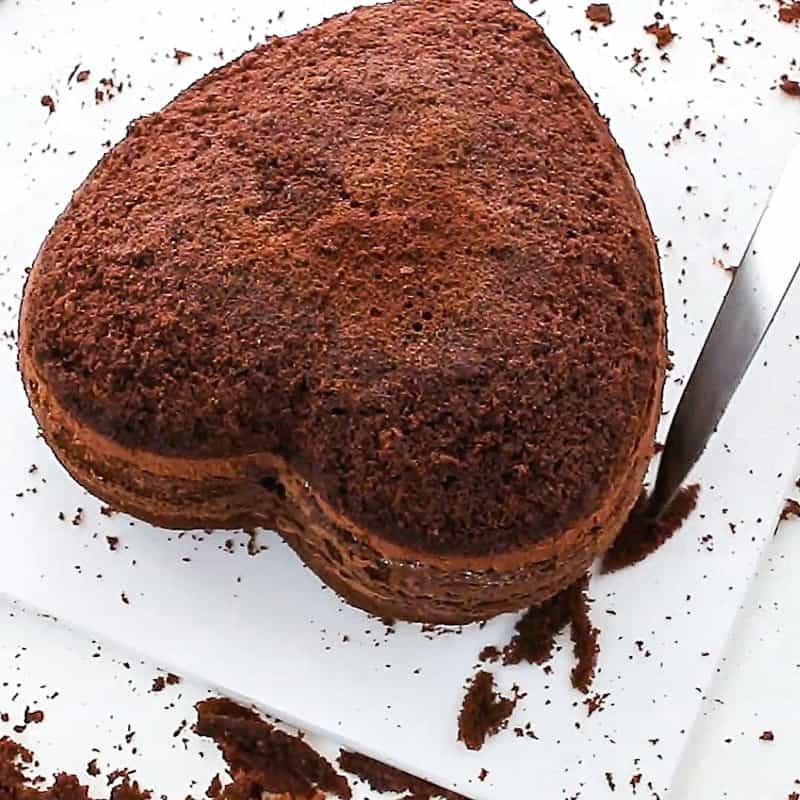 I baked three heart cake layers. Make sure to chill them really well. I normally don’t decorate chilled cakes, but this is the exception. 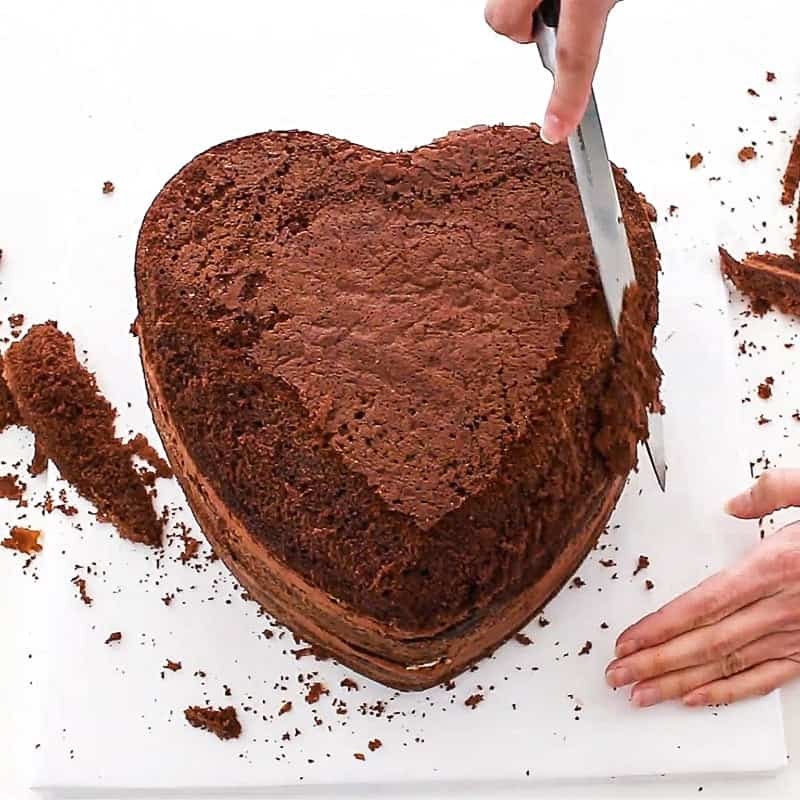 A chilled cake is much easier to carve. Yes, when you’re layering and filling them, it’ll look tall, but you need it to, so you can get that ‘puffed’ look. You’ll be cutting off all the hard edges. Now just start carving away all the hard lines. I started on the top edges. You just want a really rounded look to it, so you’ll mostly be cutting off top and bottom sides. Make sure to cut in around the bottom too. You want that to curve in a bit. Alright, chill your cake again and clean up the mess. Next you’ll crumb coat it and it’ll work better if it’s chilled. Just put a super thin layer of the chocolate buttercream all over it to seal in all the crumbs. 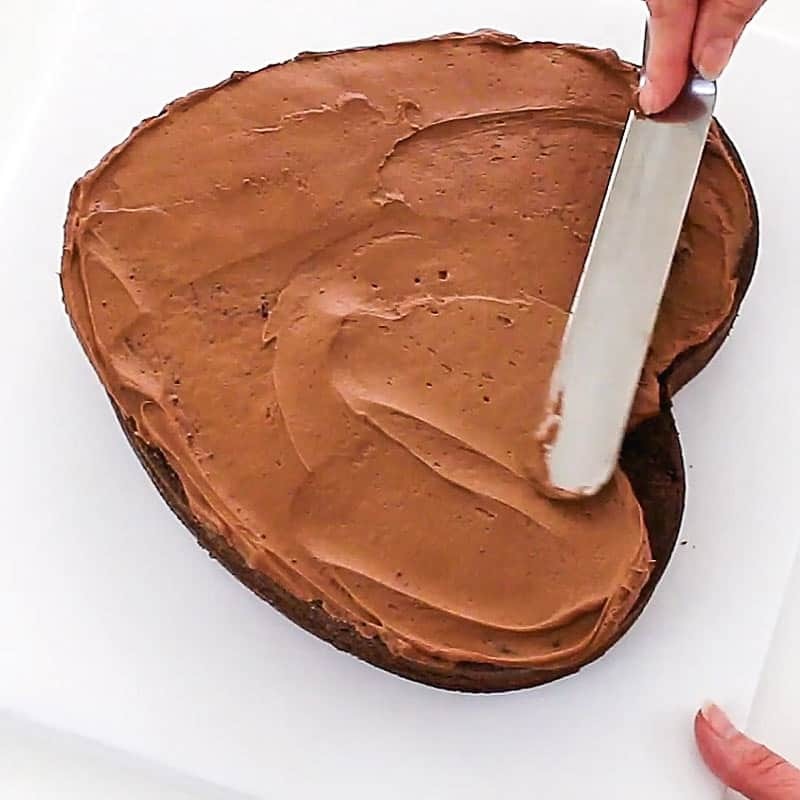 You don’t want crumbs to get all in your ganache in the next step. Just smooth the buttercream all over it and chill it again to set the buttercream. It’s okay if there are crumbs in this coat. That’s what a crumb coat is for. 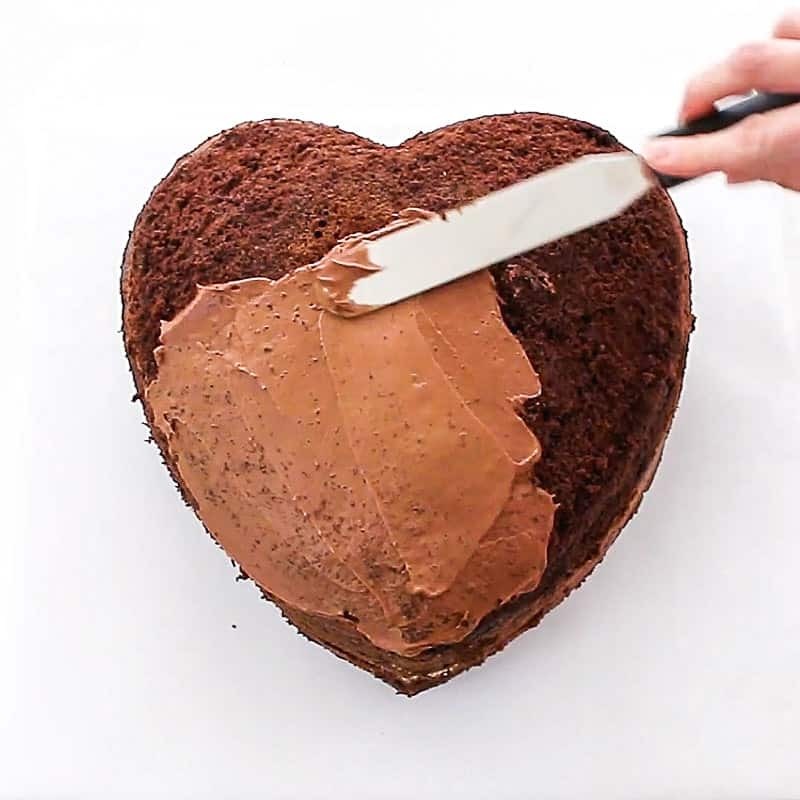 Now you’re ready to add the chocolate ganache. Remember to look in the supply list above for the ratio that I used to make it and the link to the entire post all about making ganache. 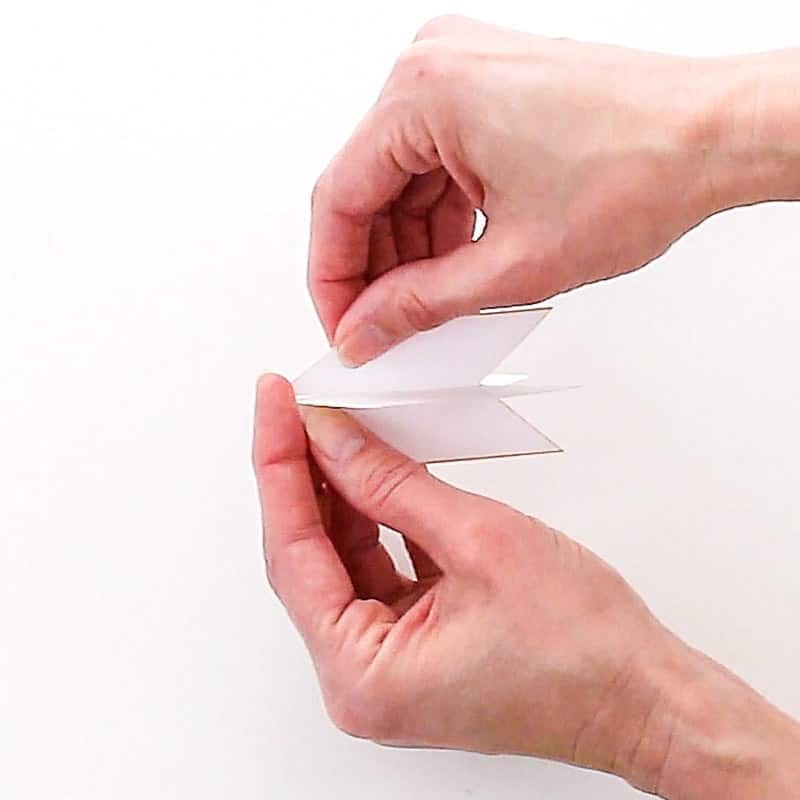 Make sure to hold the smoother curved and pretty rigid in your hand. It works well over curved cakes. Go back and fill in any holes and then smooth again. Once it’s as smooth as you can get it, pop your cake back in the fridge to chill. 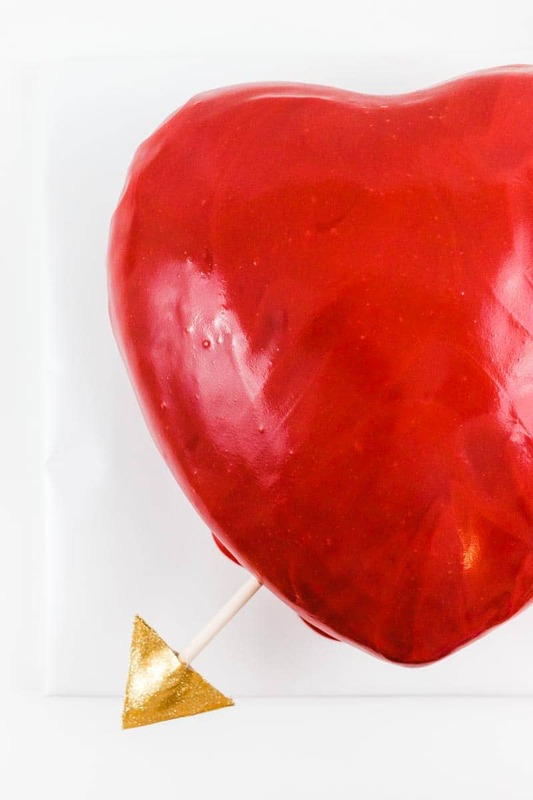 Now you can work on your white chocolate ganache. You’ll need to make this at least an hour before you’re ready to use it. It needs time to set up. Make sure to use the ratios I laid out in the supply list above for making the white chocolate ganache. 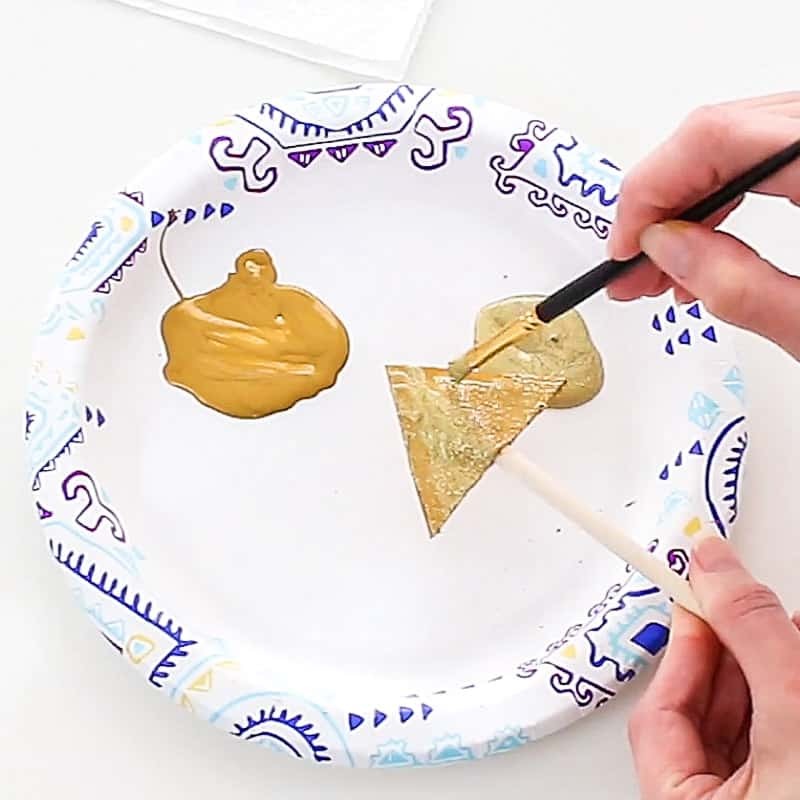 (The video will also show you how this is done.) 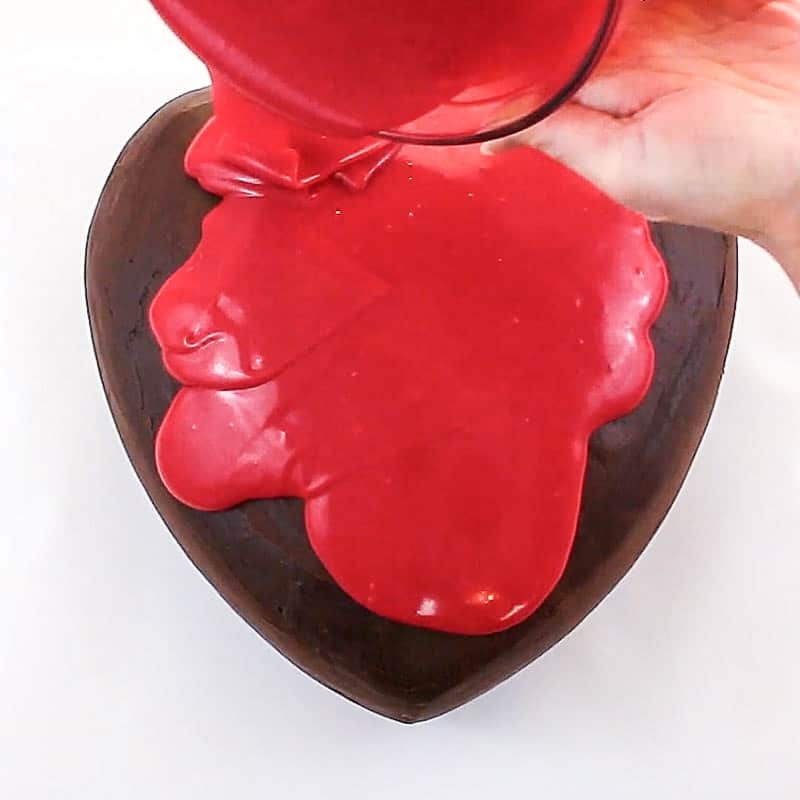 Once it’s made, add in your candy red food coloring. I used almost half the 2 oz bottle. Mix it up and chill it in the fridge for about an hour and 15 minutes or so until it’s pouring consistency. If you pour too soon, you’ll have a mess on your hands, but if you wait too long to pour it, it won’t drip down. 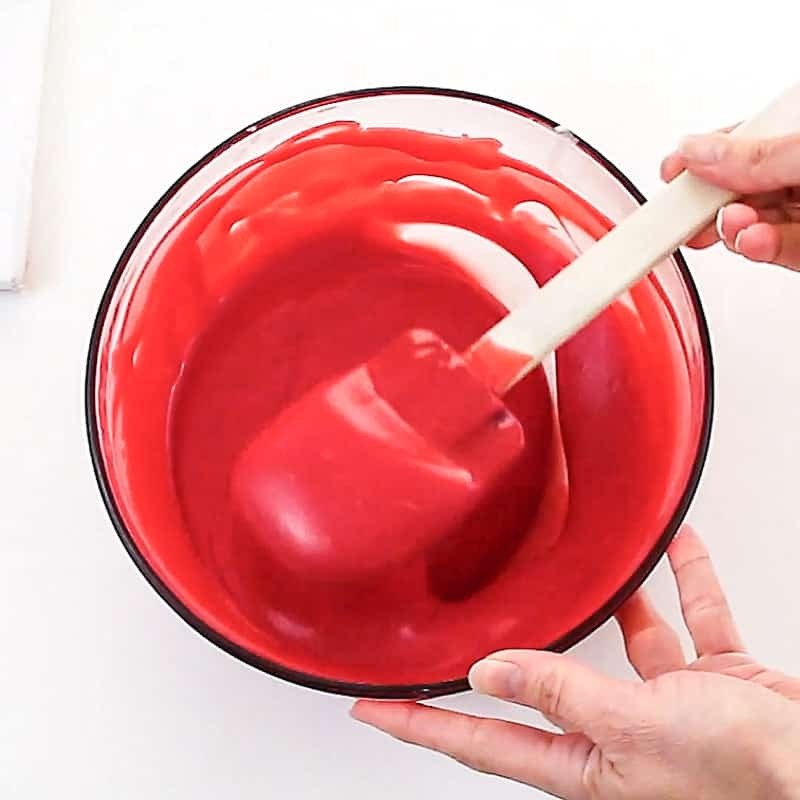 Now, if you want to cover your entire cake, then pour about 2/3 of the red ganache over it. It’ll pool around the bottom. 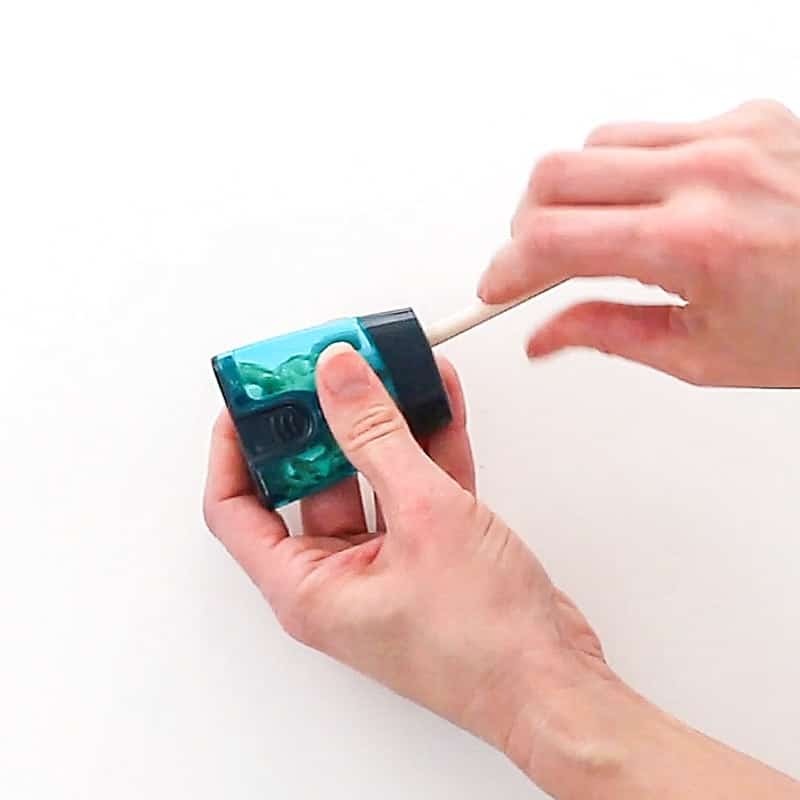 You can pop it in the fridge to chill it and set it up, so it stops pooling, or you can just clean around the edges like I did and do a second pour. The choice is yours. 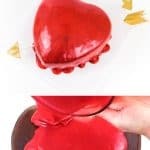 You can also just pour half the red ganache and you’ll just have the red drippy effect on the top half of the cake and the chocolate ganache will show on the bottom. Lots of choices here. Anyway, I poured and covered mine. Sometimes you can pop bubbles that come up and sometimes you just can’t. Sometimes I just end up stirring my ganache a little too rough and it causes air bubbles. I then cleaned around the base of mine. 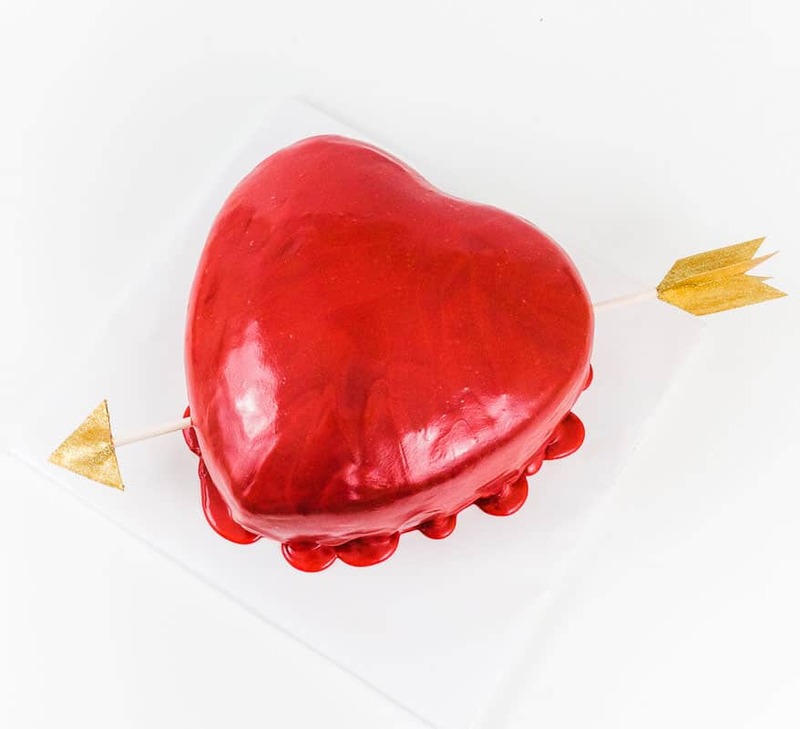 I popped it in the fridge for a few minutes, then I poured the rest of the red ganache over the top to give it that drippy look. 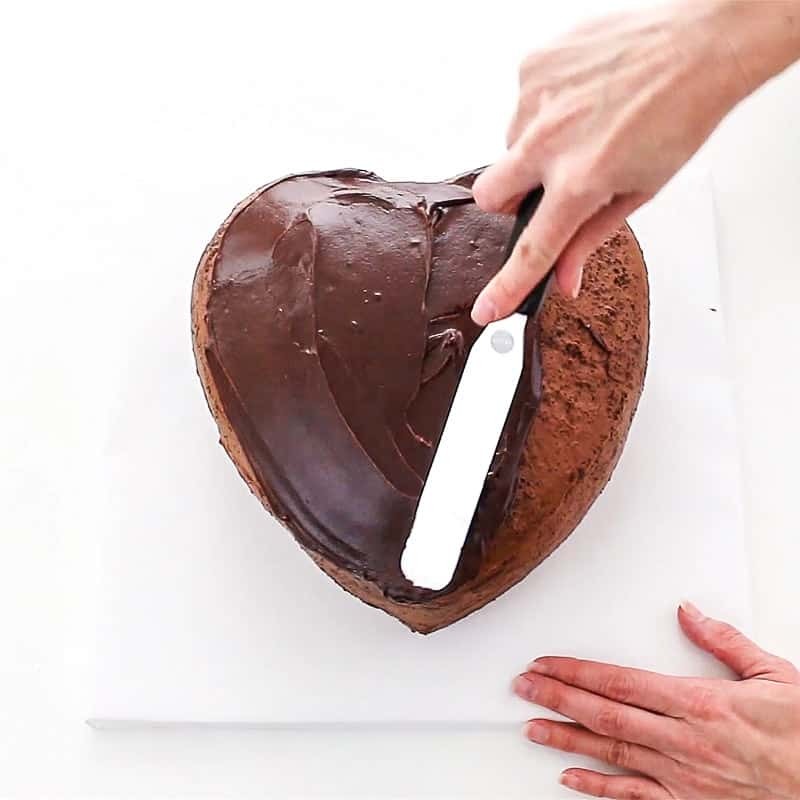 You’ll want to smooth it with a spatula. It sort of smooths out on it’s own as well. Then you can pop it back in the fridge to firm up. I left the ‘drippy’ look around the bottom this time because I liked the look of it and it wasn’t as much ‘drip’ as the first coating. Once it’s firmed up, you can insert your arrow. Just insert one at the top corner. And the other on the bottom corner. Woo hoo! You did it! Whew that was some work, right? It’s not difficult, but I know it takes a lot of time, but I think it’s so much fun and whoever you make this for is gonna know fo sho that you love them! And hopefully, they will let you share it with them. WANT TO SAVE THIS? 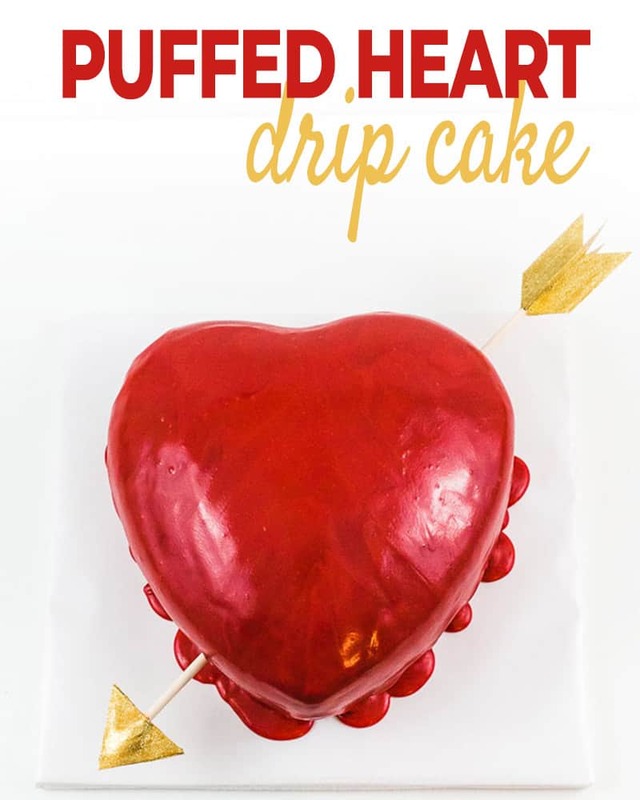 CLICK HERE OR ON THE PIN IMAGE BELOW TO SAVE THIS PUFFED HEART DRIP CAKE TO YOUR FAVORITE PINTEREST BOARD!